To Swindells, the Wildwood trail, which people use to hike between the Arboretum and Pittock Mansion, is historic. "The Hike from Pittock Mansion to Arboretum is a tradition dating back five generations. It's only been in the last 20 years it's become untenable except for a couple of hours on Sunday morning. Many hours of the day it's almost literally impassible." 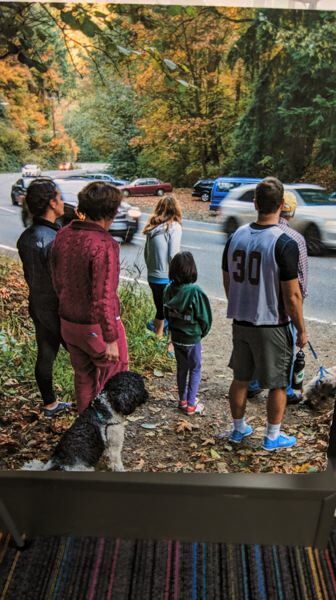 Pedestrians usually descend steep spurs of the trail down to the road, then stand waiting for a gap in the traffic, which is often coming quickly around the bend. Each hour around 2,000 vehicles pass by and there are 20 attempts to cross the road. Once built, Portland Parks and Recreation will decommission the spurs from the street to the trail and there will be no official access to the road. 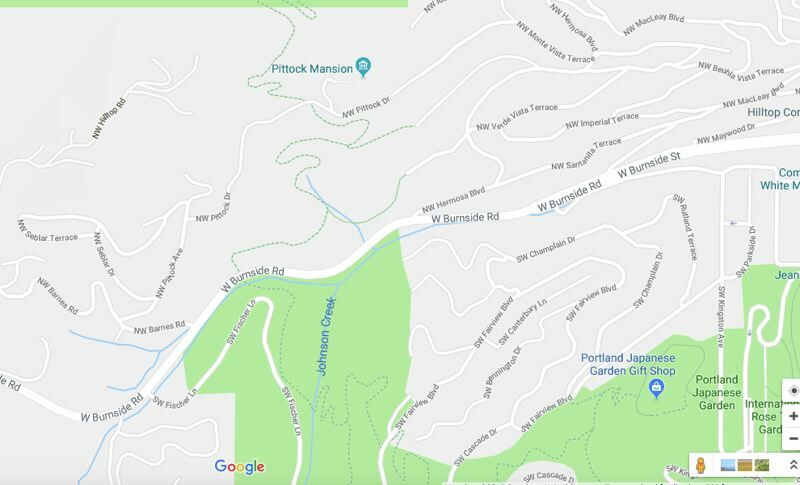 The land on the Hoyt Arboretum side belongs to the city of Portland, the land on the Pittock Mansion side belongs to Metro. That might seem like a stakeholder nightmare, but it eventually led to a flood of money. 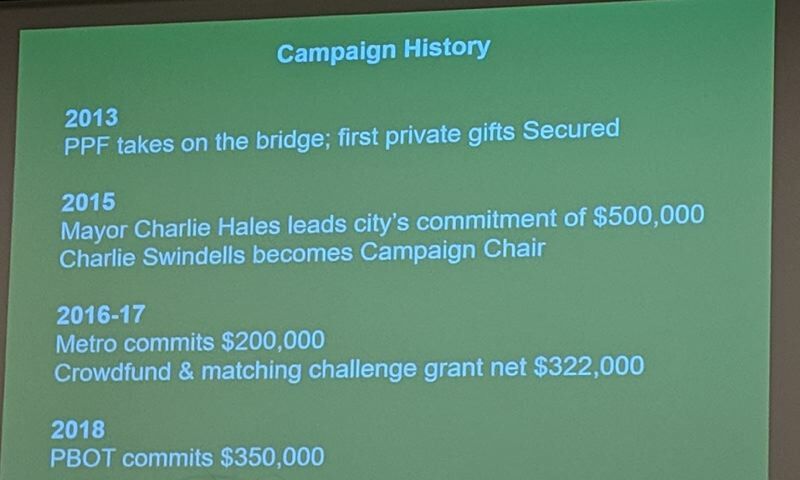 Mayor Charlie Hales earmarked $500,000 of city money for the project when he was in office. Later Metro kicked in $200,000. "Towards the end we were blessed again with system development charges procured through the Bureau of Transportation, and the parks bureau's SDCs," says Swindells. Add to that a crowdfunding campaign that raised $184,916 of $150,000 goal and was matched by $175,000 gift from an anonymous donor. 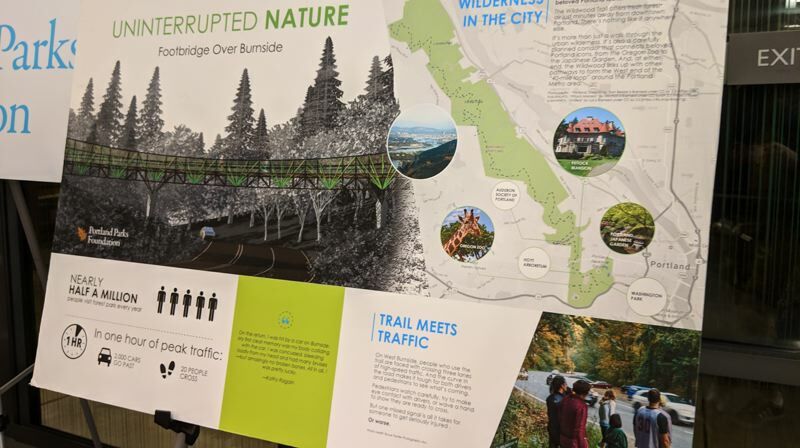 While the Parks Foundation took the lead on the footbridge project, finding the designer and raising the money, it will hand the bridge over to the City's Parks Bureau as soon as it opens. A combination of weathered and painted steel was chosen over wood or concrete because it will weather better, will look more elegant and is easier to install. Gragg called Carpenter's work "an act of activism as well as bridge design." There were certainly activists in attendance. One was Claudia Cameron. She got involved over two decades ago as a board member of the Arlington Heights Neighborhood Association. She wanted her group to be a positive influence and accelerate getting a bridge over Burnside. 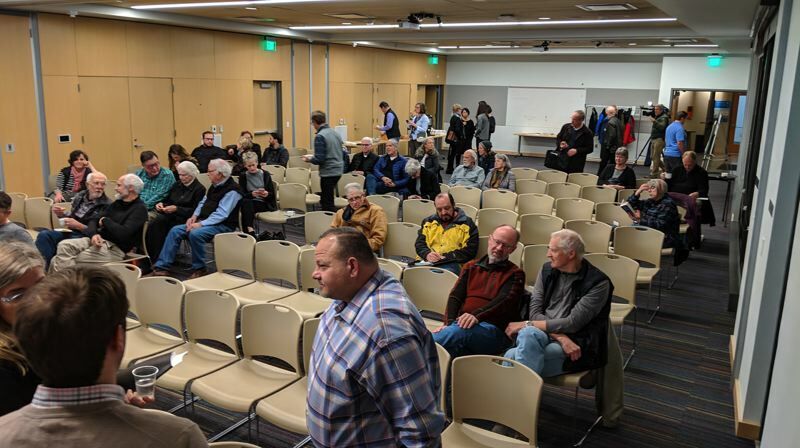 She said that given Portland's high tax rate she was staggered that they couldn't build a simple pedestrian bridge in such an important area. "In 2006 when I personally met with then mayor Sam Adams he said it would never happen. He said there's too many other priorities. Well, obviously it was happening in the background, I'm thankful to say. I grew up in the area and have seen the increase in traffic and the extreme danger in crossing Burnside. You have to run across four lanes of traffic going 45 mph, coming around curves, it's extremely dangerous." She and her husband were among the 900 private donors who gave cash, but she says that pales in comparison to the time and passion people put in. "The trail is so beautiful and so incredibly dangerous, if you're attempting to walk across from one part of the park to the other." 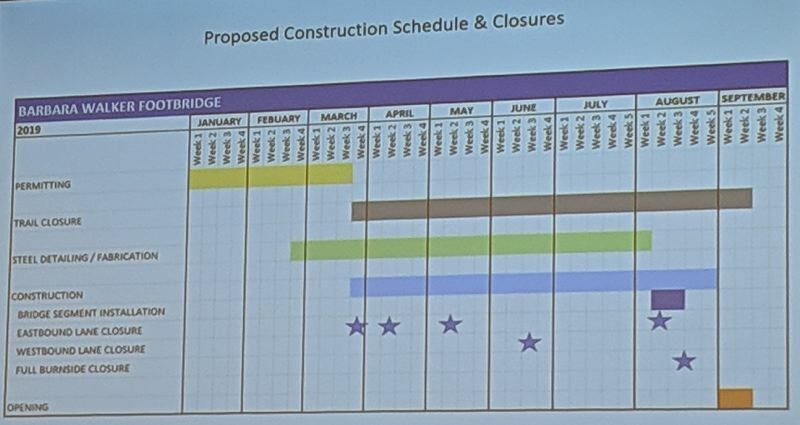 Audience members noted during the meeting that the power lines near the bridge site were absent from the final renderings. They wanted to know if they will be moved, buried or remain. Gragg said they were working with Portland General Electric and trying to come up with a solution. Cameron spoke up, saying she was worried about further delays to the project. "I'm optimistic right now. I don't know if they'll go entirely away but it maybe (have) less impact, so stay tuned," said Gragg. Cameron told the Business Tribune, "These red herrings can delay efforts. In my experience, every time there's public utilities or private parties, that can impact something, I get worried. The project needs to go and I was really happy to hear it's going to happen." She is a runner and a dog walker and uses the Wildwood trail four or five times a week. "I grew upon these trails and it means everything to me." "I do cross it, it makes me very nervous. I time it, I run. You have to run. If you trip you will die. I check to make sure my shoes are laced, my pockets are zipped so I'm not going to lose anything. If I'm with someone I'm very worried about them. It's very dangerous and they've let it go on for decades." Cameron used to be the VP of operations for a Portland tech startup. "In private, for-profit businesses it's a much more direct path between two points," she said about dealing with public agencies. 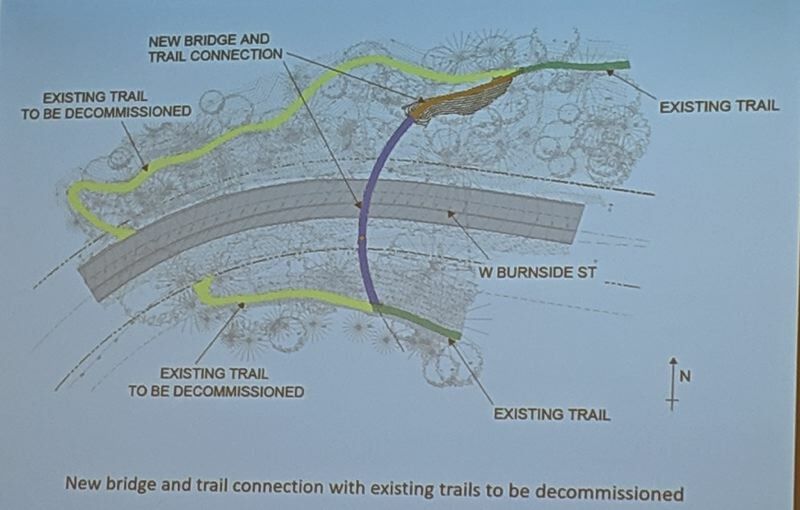 "This is very challenging and I have tremendous admiration for people who can hang in there This is really important and it'll make the park accessible to people who can't run across four lanes of traffic." Many at the meeting seemed to know each other. 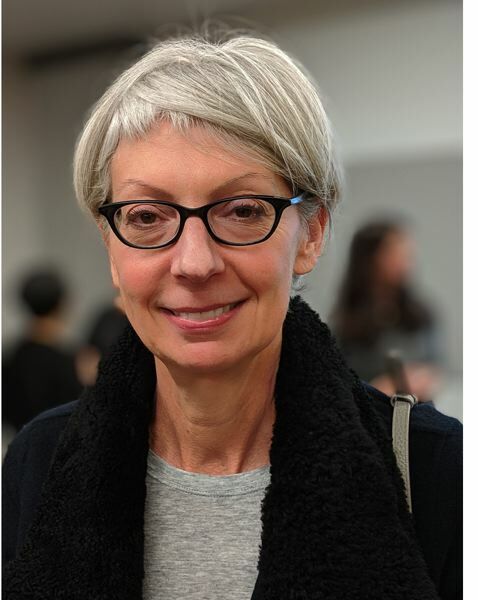 Cameron's friend Julie Vigland is the former chair of the Oregon Arts Commission and was formerly on the Parks Foundation board, helping form a steering committee focused on fundraising for the bridge. "It's not something we've done before, we haven't built a bridge, we haven't built a project. We'd raised money for a project that Parks would do, so we took this on, independently, with Parks as a partner, but we committed to raising the money and building the bridge." People who use the trails loved the bridge idea. "We had at least two people come into the office with a check, not insignificant checks. It was alluded to tonight is the people's bridge, I truly feel that, truly."